Big props go to Petite Crystal of My Little World for posting about this place. 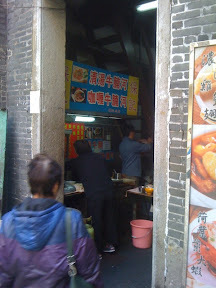 Not really knowing where to go for food in Macau, I googled ‘macau breakfast’ and came up with a great entry on her blog. So following her advice, @eatnik and I went down to Senado Square, and followed the map to Rua Dos Mercadores (see map below). About 20 metres from the intersection with Ave de Almeida Ribeiro, is a little doorway to a laneway called Patio do Cotovelo. 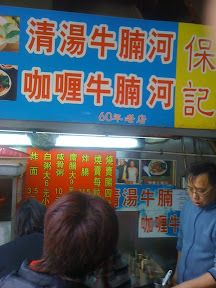 Inside, is a little breakfast joint which dishes up cheong fun (steamed rice paper/noodle), brisket noodles, and congee. 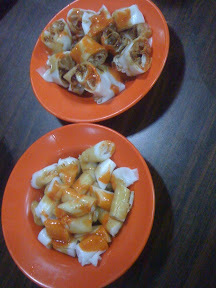 We were only there for the cheong fun, though the locals seemed to chowing down on everything there quite happily. I was a little at a loss with the menu – my recognition of characters isn’t the best in the morning – until one of the little ladies working there graciously started reciting everything to me. She clearly had other customers to serve, and I was in the way! 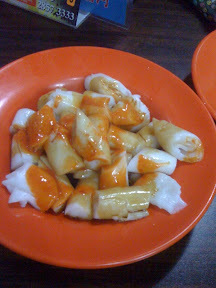 I ordered the two types of cheong fun on offer – the plain, and the zha leong (steamed rice noodle wrapped around a Chinese donut). 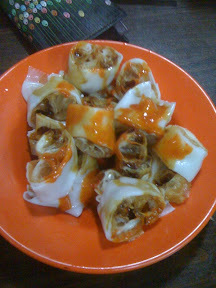 As you would expect from a place that is renowned for their cheong fun, the rice noodle was thin and tissue-like. The plain one unrolled at a touch, and there was none of the claggy gelatinous texture which you get at a lot of yum cha places, due usually to over-steaming, I believe? The thin silky layer of cheong fun wrapped around the crispy donut in a good zha leong creates a great textural combination. It’s an old favourite of mine when done well, and it certainly was done well here. I like the fact that there’s also a temperature contrast here, as the donut is cold when wrapped with the hot cheong fun. I was very lucky, because at this point, @eatnik had decided that the next week was going to be a struggle for her if she were to try to match me bowl for bowl in the eating stakes. 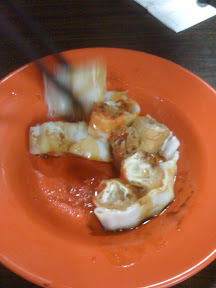 So I got to eat more cheong fun than was equitable! 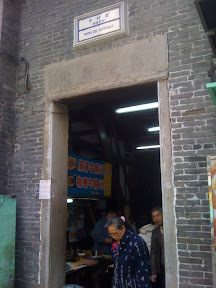 I am so curious about Macau – one day! Love the old stone portal. Ooo how was the sauce like on the plain cheong fun? Only a man who knows his cheong fun would ask that! It was pretty good – a sesame sauce, not really sweet or salty. 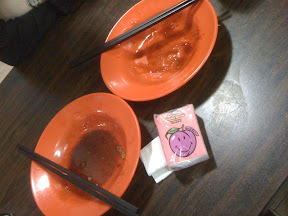 The chilli was a touh disappointing, it tasted pretty much like sriracha.